1) A cigar wholesaler, several retailers, and a cigar enthusiast are challenging the tobacco ban recently passed in Prince George’s County, Maryland (just outside the District of Columbia). The law bans selling cigars individually and in certain instances even classifies cigars as drug paraphernalia. 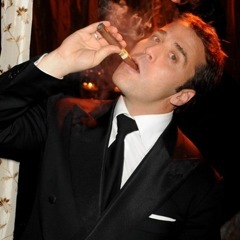 2) No surprise to most people, it seems that celebrities like smoking cigars, or at least they like being seen smoking cigars. And from the cigars we can identify from this collection of celebrity stogie pictures, it seems that many enjoy Cuban cigars. The exception being actor Jeremy Piven (right) who appears to be smoking a Padrón 1964 Anniversary. 3) Inside the Industry: Felipe Gregorio has decided to sever ties with Miami Cigar which had signed on to distribute the Dominican company’s cigars only three months ago. The Fuente and Newman families have set the date (July 14-16, 2009) for the 12th Annual Cigar Family Celebration, which features tours of the facilities and of the work done by the Cigar Family Charitable Foundation. 4) Deal of the Week: It’s not too late to take advantage of these Christmas Specials from Cuban Crafters. Most of our favorites, including J.L. Salazar, La Carolina, Miami Medina, and the CC Cameroon, are on sale. One particularly good deal has a box of the 4.5 stogie-rated Don Kiki Brown Labels available for just $29.99 (down from $90). Get them all here. I picked up the Don Kiki Brown and C.E. Beck at Cuban Crafters at extremely low prices. I had a Don Kiki Brown yesterday and a Beck today – both fantastic. If you haven’t tried the Cuban Crafters line of cigars, now is a good time with their sales.